So last week while I had been sitting in a coffee shop in Brooklyn for 3 hours doodling away, I remembered to look up what shows were playing while I was visiting. I found that 'Lost in the Trees' & 'Plants & Animals' were playing in 30 minutes at Bowery Ballroom. I had never heard of 'Lost in the Trees' but did like some of 'Plants & Animals' that I have previously downloaded so I decided to go at the last minute! I hopped in a cab and got there one song in for 'Lost in the Trees' performance. I am SO glad that I made it and got to hear their set, it was absolutely stunning. One of the best feelings is having no expectations of a band because you've never heard them before and they blow you out of the water and spark up emotions inside of you. That's exactly what happened from seeing this show. 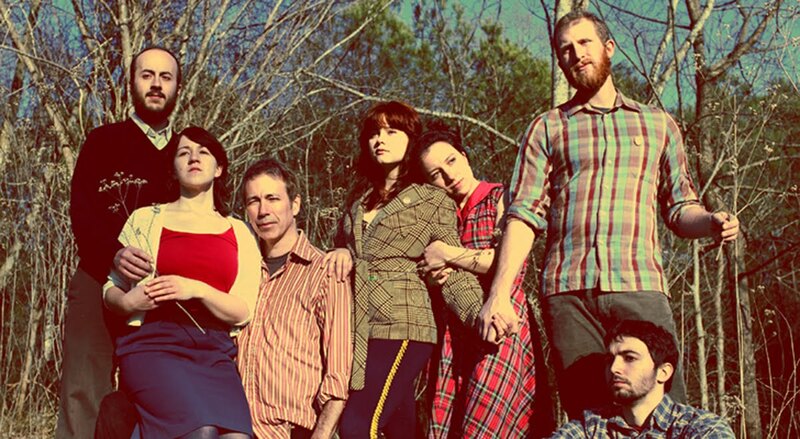 Lost in the Trees is a musical collective from Chapel Hill, North Carolina and Ari Picker, founder of the band calls their sound "Orchestral Folk Music" because their sound features arrangements which endure the dramatic power of classical music while having the singer-songwriter intimacy. Their first album, "Time Taunts Me" came out in 2007 and their new album, "All Alone in an Empty House" comes out August 10th. I am sure the new album will be one that I will play on repeat from the sound of their set. At times when all of the instruments were exploding beautifully together and Emma Nadeau was singing, they reminded me a bit of Arcade Fire. Emma Nadeau was one whom switched between various instruments; french horn, bells, and accordion.